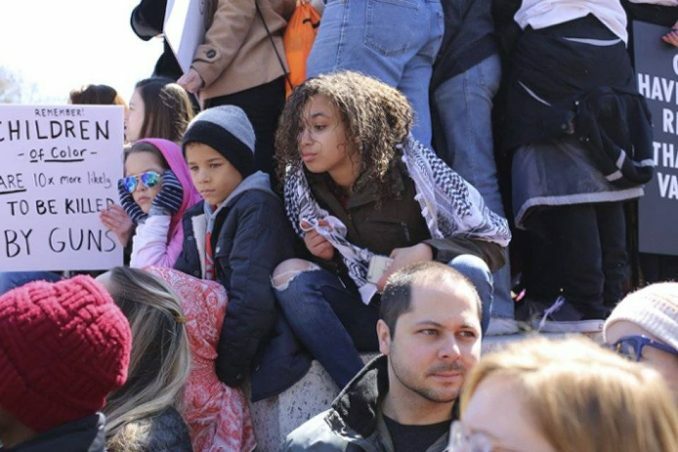 The outrage and organizing skills of high school students who survived the mass school shooting in Parkland, Fla., on Feb. 14 have grown and spread in the weeks after, until on March 24 more than half a million people demonstrated against “gun violence” in Washington, D.C. Hundreds of thousands more poured into “sibling marches” in more than 800 cities in the U.S. and internationally. The breadth of outrage echoed the mass turnout for global Women’s Marches after the election of right-wing President Donald Trump. The historical shadow of the “Children’s March” in Birmingham, Ala., hung over the D.C. demonstration. On May 2, 1963, thousands of Black school children, some as young as six years old, marched and defied police dogs, fire hoses and police beatings to protest the violence of racist segregation. It was a chilly morning in Washington, D.C., when comrades from Baltimore, Md., Washington, D.C., Durham, N.C., and the New York metro area gathered for the March for Our Lives anti-gun rally. This rally was organized by students who survived the Feb. 14 shooting at Marjorie Stoneman Douglas High School. That school serves a diverse but largely Jewish community in Florida. It is no coincidence that Nikolas Cruz, the shooter who expressed racist, homophobic and anti-Semitic views on social media, targeted this school. Indeed, of the 17 killed, more than half were Jewish, immigrants and students of color. Reaching out to some of the 500,000 people in attendance, WWP members, candidates and supporters handed out newspapers, letters and flyers that called students to fight bigotry and advocated for the only solution that will end systemic gun violence: socialism. Many of those at the D.C. march carried signs advocating for a ban of assault rifles and semi-automatic weapons. But one could not ignore the irony that an anti-gun rally was being managed by heavily armed police, as well as by army tanks and soldiers carrying the very weapons the people were asking to ban. The most targeted gun in mainstream discourse on gun violence today is the AR-15, one of the most popular guns sold in the U.S., and notoriously used in mass shootings. Since 2007, at least 173 people have been killed in mass shootings involving the AR-15. Indeed, the rally took place less than a week after Stephon Clark, a 22-year-old unarmed Black man, was shot and killed in his family’s backyard by Sacramento, Calif., police. Patterns of police brutality are clear evidence that disarming the people while further arming the state would be a bad idea. 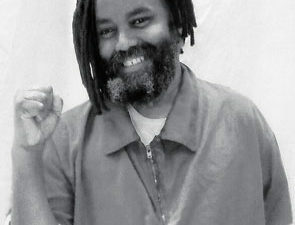 Lee Patterson, an elder comrade from the Baltimore branch, held nothing back: “The democrackers won’t save you!” he urged, handing out WW newspapers to all who would take them. WWP comrades rallied in the crowd for about four hours, advocating not for voting or gun control, but for examination of a system that empowers white supremacy and toxic masculinity. 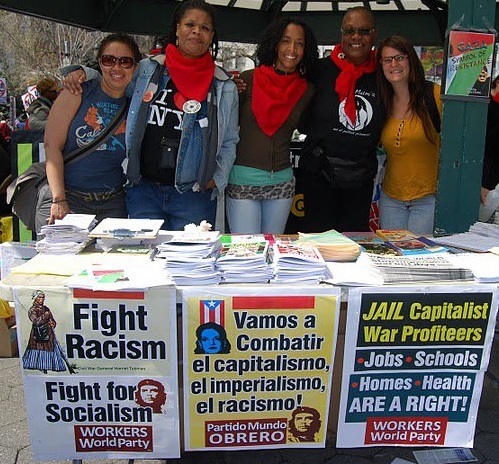 Engaging marchers in conversations about the historical and economic roots of gun violence, comrades reached out to connect to future comrades in the struggle and stood in solidarity with all those impacted by the violence of capitalism both here and abroad. 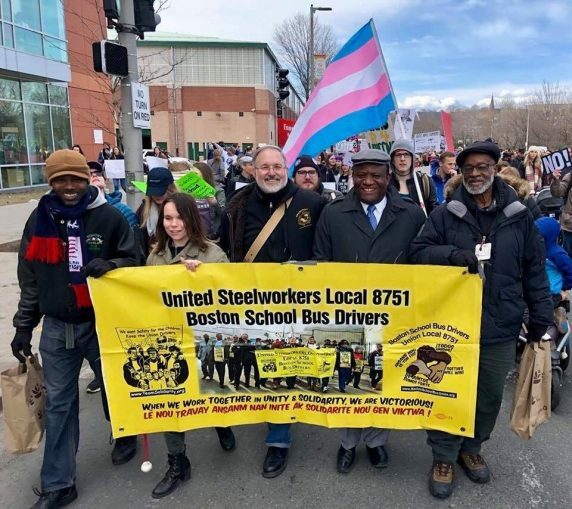 USWA Local 8751 Boston School Bus Drivers president Andre Francois (front, second from right) marches with members and supporters. In Boston, more than 100,000 people gathered and marched from the heart of the Black community outside Madison Park High on Malcolm X Boulevard. At the same location on Aug. 19, 2017, the Black Lives Matter movement led a march of more than 40,000 people united in anger and determination to stop white supremacy, Nazism, fascism and the Klan. Chanting, “Enough is Enough!” and “Black Lives Matter!” the student-led protest was a growing expression of organized solidarity among students, unions and community organizations. There was strong participation from many school, health care and public sector unions, including the Boston Teachers Union, led by President Jessica Tang, and several other teachers’ unions; the Massachusetts Nurses Association; the Service Employees Union; and the immigrant-led Boston School Bus Drivers Union, Steelworkers Local 8751, headed by Haitian President Andre Francois. The march concluded on the Boston Common with a large rally and a sea of students surrounding the stage. The crowd listened to youth leaders address the many issues that intersect with gun violence and massacres in schools. At least 50,000 mainly young people gathered in downtown Denver, hoping to end the domestic terror of a U.S. glutted with guns. Their energy and hope were clear, and their goal was to change the laws and support candidates who fight for their safety. What was not so clear was how the lives of these young people have been affected by a U.S. on war footing for the last 17 years, since before most of them were born. Their protests were loud against the National Rifle Association, but the connection was not made to the NRA as a powerful voice for the colossal U.S. arms industry. This profit-making behemoth legally and illegally supplies massive arms to every side of every conflict around the world in addition to supplying the huge U.S. military. The cost is paid in the lives of children in Syria, Iraq, Afghanistan, Yemen, many countries in Africa, as well as at home in the U.S. There will never be peace from guns at home while the U.S. continues its international military assaults with arms. 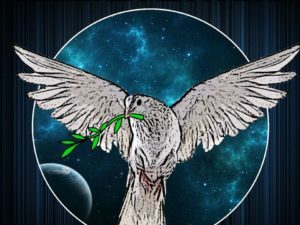 We must help draw the connection between U.S. “gun violence” and the arms industry that is costing children their lives here, as well the youth who are victims of present U.S. wars of aggression in more than seven countries around the world. 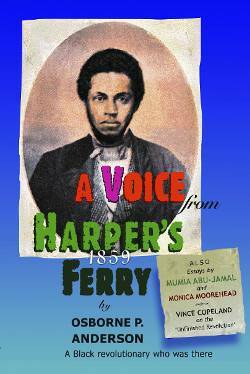 Also contributing to this report were Betsey Piette and mYa X.